Please pick the correct version of Snap Sampling Plans! that meets your needs. If you do not have Microsoft Access then please select this version. Microsoft Windows only. Need an attribute sampling method that supports your inspection activities? Want to quickly apply the correct sampling method based on your production methods? 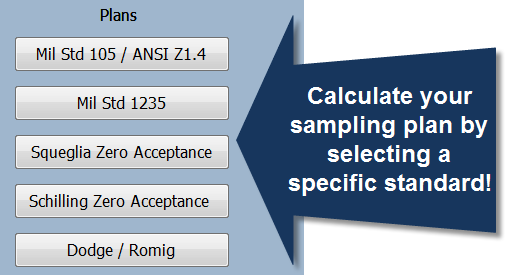 Want to swiftly determine the correct sample size, accept and reject criteria for your inspection? Think statistical sampling plans are difficult, confusing or complicated? Need to check your company's sampling plans for the correct application? Make up your own sampling plans? Need to learn about a specific sampling plan because of your customer requirements? Want to improve your Quality Systems? 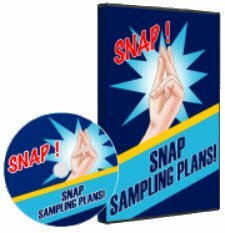 If you answer yes to any of the above questions, then you need Snap Sampling Plans! Many companies use the wrong inspection sampling plan because managers, engineers, supervisors and inspectors have not been trained in statistical sampling. Because of this, they may create their own deficient sampling plan. Alternatively, they may use a known industry-standard plan without fully understanding that standard's purpose or methods. When this occurs, they put their business and their customers at risk. In addition, they waste valuable inspection time and inspection cost. Don't let this happen to your business. Snap Sampling Plans! Software combines all the key industry standard attribute sampling plans into one place. Because there are over 10,000 sampling possibilities, you need this software to eliminate the confusion. Snap Sampling Plans! guides you in selecting the correct sampling plan. 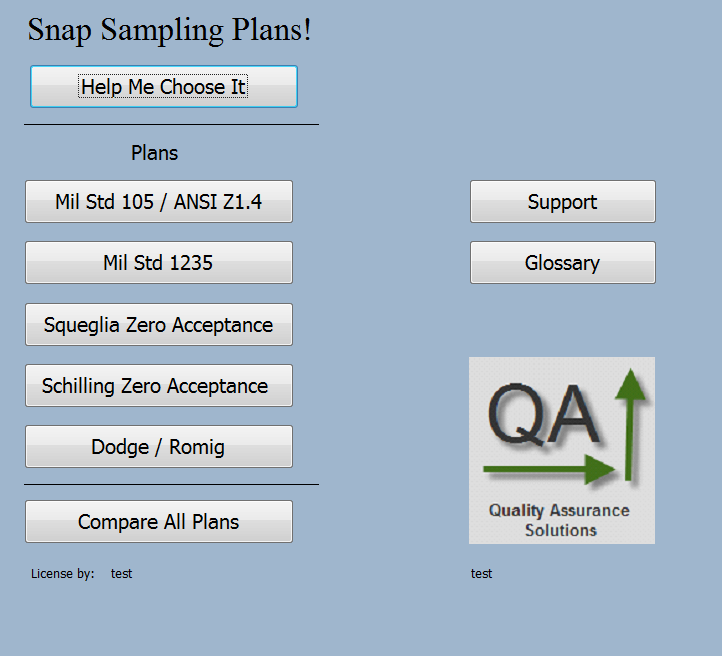 With Snap Sampling Plans!, you answer a few yes / no questions, and then you provide your desired AQL and lot size. As you answer the questions, the software details advantages and disadvantages to your choices. Snap Sampling Plans! then produces one specific sampling plan that matches your specific needs. For intermediate users, you can easily select your desired industry standard. Input your required AQL and lot size. 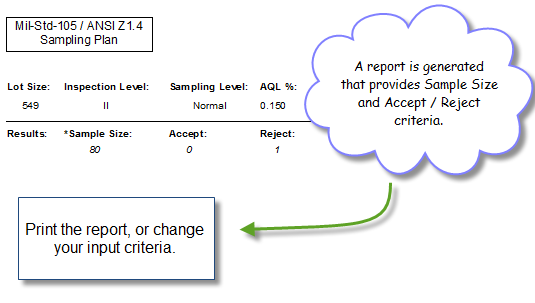 Instantly you have your sampling plan report with sample size, accept and reject criteria. If you're an advance user, you can compare the sampling plans. 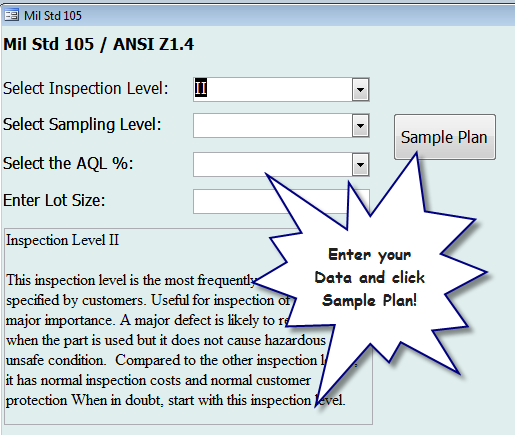 Input your AQL and lot size, Snap Sampling Plans! provides the possible sampling plans from all the included industry standards. This valuable tool lets you research, compare and select a plan that works best. With this tool, you may decide to change your production method or inspection method to a better fit. With this info, you can save your company significant money because it helps you design lean inspection and production. Snap Sampling Plans! incorporates the attribute sampling standards from Mil Std 105 / Ansi Z1.4, Dodge Romig, Mil Std 1235, Schilling Zero Acceptance, and Squeglia Zero Acceptance Plans. As a bonus, with purchase of the software, you will receive copies of the non copyrighted standards for your review. Linked instructions for purchasing the copyrighted standards are also included. Within 30 days, if you are not satisfied with Snap Sampling Plans!, I will refund your money. Snap Sampling Plans! is only $49.